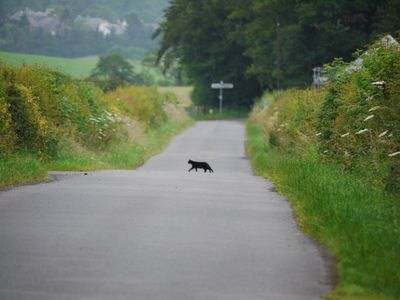 Question: we all have heard at some point in our lives that if a black cat crosses our path its bad luck! But what makes this phenomenal bad luck? Information: Black Cats crossing our paths weren’t always considered bad luck. In fact, ancient Egyptians held cat’s as scared animals; to kill one was considered a capital crime. It was around the middle-ages in Europe that the Black cat was associated to bad luck; the reason for this was because at this time the Catholic Church was attacking these so called witches believing to be associated with the devil anyone accused of witchery was usually killed. Europe initially began to consider females as witches, these females were typically poor lonely and old; many of which held cats for companionship. For this reason cats began to be associated to bad luck therefore the superstition began many centuries ago but is still wildly believed by many today. Inferences: Some people hold the belief that the back luck can be reversed by doing certain things such as, having a white cat cross your path. Another way to reverse the curse of a black cat crossing your path is to first walk in a circle, and then go backward across the spot where it happened and count to 13. Point of View: I find it fascinating how a superstition created by our ancestor’s centuries ago still has an effect on society today. There is clearly no reason to believe that a black cat crossing your path is bad luck, this is a silly superstition. In Chinese culture, cats are considered good luck. We have the Jīnmāo, or the Lucky Cat. Most Chinese businesses have the lucky cat displayed in public to bring in good fortune and luck to their establishment. I agree that the idea that cats were bad luck stemmed from Europe with the association with witches. Ironically, the Black Plague could have been less severe if the Europeans did not try to exterminate all the cats, who could have killed the disease ridden rats that came to Europe.